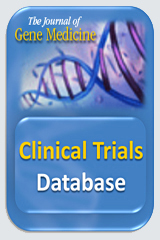 The Journal of Gene Medicine Clinical Trials Database is the most comprehensive source of information on worldwide gene therapy clinical trials available on the internet. Bringing you the number of approved, ongoing or completed clinical trials worldwide. The Journal of Gene Medicine publishes high quality original articles and reviews on the science of gene transfer and its applications in gene and cell therapy. Key areas of interest are the design and production of vectors, delivery and targeting, gene expression and regulation, preclinical studies including animal models, developmental aspects and clinical trials.